Let's Talk Tech! - Volunteer Sign Up! 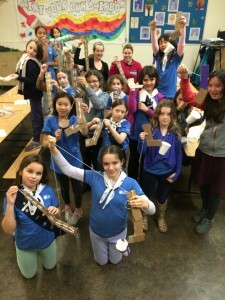 Geering Up is excited to host an Engineering Badge Day for Girl Guides in the Metro Vancouver area! We will provide hands-on activities and projects so girls can work towards their Girl Guide Science & Technology: Engineering Badge. Girls will get creative and participate in fun engineering activities, connect with other guides and talk to current engineering students who will share their stories and experiences. This is a great opportunity for girls to visit the UBC campus and ask all the questions they may have about university life and engineering! This is a free program open to all Guides, Pathfinders, and their Guiders. Registration is individual – girls can come by themselves, with a Guide friend, or as a unit with leaders. Leaders can also attend individually. Deadline for receiving complete registration packages is April 26th, 2019.